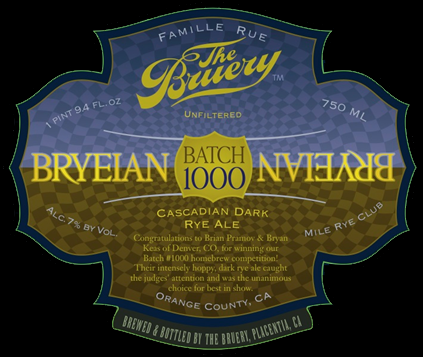 BATCH 1000 – BRYEIAN is a Cascadian Dark Ale/Black Ale with a 7% ABV that was brewed to celebrate their 1000 batch of beer. 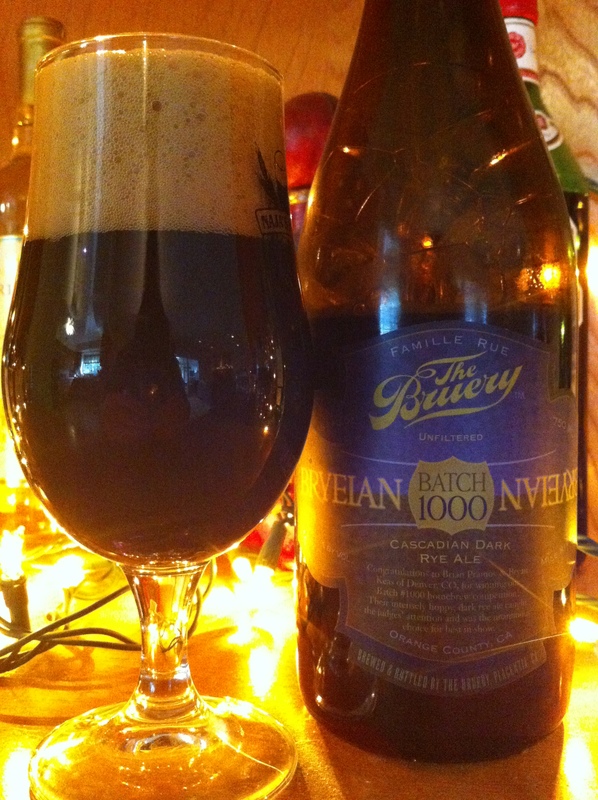 Join us in excitement as we release the winning brew from our Batch #1000 homebrew contest – Bryeian! Hard to believe that we’ve brewed 1,000+ batches of beer and for those who have been with us throughout the years, probably surprising to see that the winner is a hoppy ale! A cascadian, dark rye ale to be exact. Brian Pramov and Bryan Keas, a pair of homebrewers from Denver put together this winning recipe for us and it shined brightly in our competition. The roast of the dark malts, the spice of the rye and the intense hop character combine for a fantastic experience. Bryeian poured a deep black with a thick chocolate head. This very foamy/creamy head left behind splashes of foam on the side of the glass as the beer went down. The nose lived up to the style description on the bottle (Cascadian dark rye ale) and smelled absolutely delicious. Notes of wood/cork, chocolate, pine resin, rye, and spice were all present. As it opened up these smells did have a tendency to coalesce as a big alcoholic booziness took over. A 50/50 blend of milk chocolate and pine kicked off the tasting portion of the review. Grassy hops, herbal notes, rye, and a touch of wood each came through in the middle. It finished with a non-abrasive bitter chocolate sweetness and a touch of cigar. Mouthfeel was lighter than I expected from a beer this color, but I guess that’s more in line with the CDA style. It went down smooth, but the cigar/wood tannins dried things out a smidge. Just when I start to get disappointed with the Bruery they go and make something like Bryeian. Everything you’d expect from the beer is in there and nothing seems out of place or unnecessary. The depth of flavors was fantastic and kept this beer interesting sip after sip.